The design process began in the fall of 1914 at the Putilov factory. Initiator and inspirer of the project was a Major-General N. Filatov, which then held the post of Chief Officer of the Infantry school. 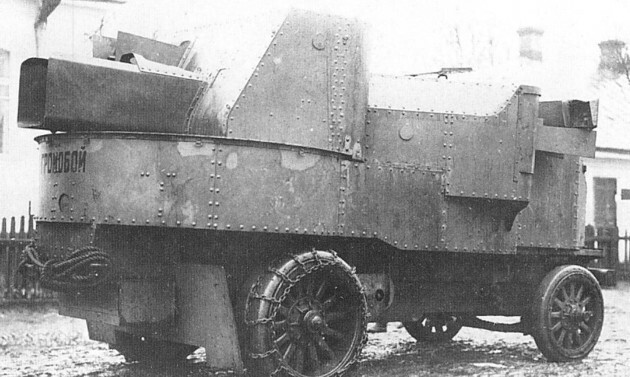 In his mind, this armored truck was supposed to strengthen the quality of armored cars platoons on the battlefield. He also personally drafted the future armored vehicles of the Russian Army. As a base for the project, a biaxial RWD (4×2) 5 ton truck was chosen, then produced by the American Garford Motor Truck Co. This truck had a top speed of 35 km/h (22 mph), and an empty mass of 3,931 kg. This model had already attracted the attention of the Army for its high payload, allowing the use of thicker armor and heavier weapons, including artillery. The other decisive factor was the presence of these trucks in Russia by the middle of December 1913 in Petrograd, previously purchased by the General Commission and waiting in the garage of the Military automotive school. However, the initial choice of a 76 mm (2.99 in) gun model 1910 was at first dismissed as imposing significant modifications of the truck chassis and a number of other technical problems need to be addressed. Comparative tests were carried out at the Infantry Officers School in November 8, 1914, with the Maxim 37 mm (1.46 in) autocannon, the Hotchkiss 47 mm (1.85 in) rapid-firing and the 57 mm (2.24 in) Nordenfeld, all three well-proven calibers used by the navy to destroy torpedo boats at short range. The 76 mm (2.99 in) was nevertheless selected. It was a revised version of the compact and light 3-inch mountain gun Model 1909, mounted on a new and lighter molded carriage. Serial production of this weapon began at the Putilov factory in 1911 and continued until mid-1915, with 407 guns built in all. It usually shared its ammunition shells with the Model 1909 mountain gun, but with a reduced charge. Maximum initial velocity of the 6.5 kg HE shell was about 381 m/s (1250 ft/s), and for the canister shot about 274 m/s (900 fts). The gun was mounted on the rear platform in a pedestal made ​​of iron sheet with welded joints. A cupboard-shaped armored turret was attached to the platform by 12 bolts. The traverse was conducted in short stops using a simple optical sight. Effective firing range was about 3000 m (9840 ft) and ammunition storage sufficient for 44 shots, 12 of them housed in the turret, and 32 in the machine-gun fighting compartment. The gun barrel itself was protected by an U shaped shield. Auxiliary armament comprised three 7.62 mm (0.3 in) Maxim machine-guns model 1910 with the usual water-cooled barrel. Two were placed in side sponsons, and the third in the rear turret, side by side with the gun. These were fed by tape cartridges with 250 rounds each, 20 tapes in all (5,000 cartridges). The armored body was developed by NM Filatov and had an innovative design, featuring rolled steel sheets produced at Izhorskogo Plant, with a thickness of 6.5 mm (0.25 in), immune against the 7.62 mm (0.3 in) Russian Mosin rifle model 1891 and 7.92 mm (0.31 in) German Mauser rifle model 1898, but also armor-piercing rifle bullets. Assembly was performed by rivets fastened to a metal frame attached to the chassis. The body armor was mostly vertical although several elements had a slight slope. Thickness differed from the Army and Navy models, as followed: body front 6.5 mm/9 mm, sides 6.5/7 mm (0.26/0.28 in), radiator 6.5/7 mm (0.26/0.28 in), bottom 6.5 mm (0.26 in), roof housing 6.5 mm (0.26 in), forehead turret 6.5/13 mm (0.26/0.52 in), side sponsons 6.5/7 mm (0.26/0.28 in). The hull was divided into three sections. 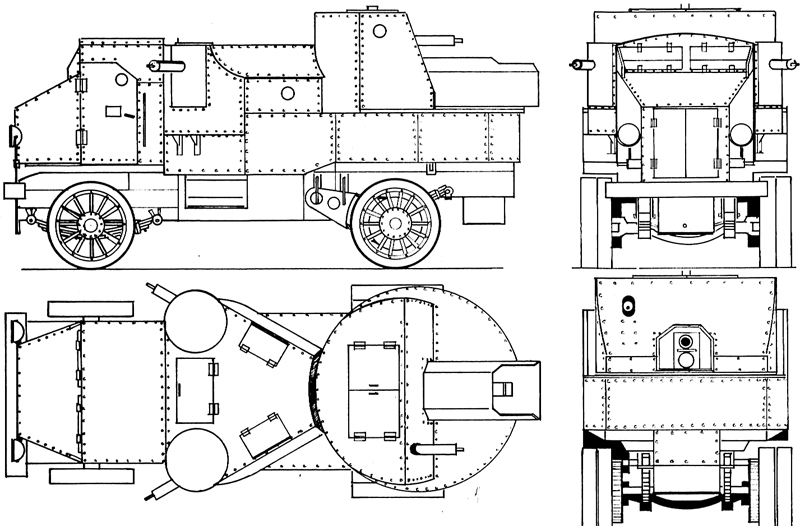 The front section comprised the engine, armored two-hatch radiator, the driver and commander seats behind, with the fuel tanks in between to reduce the overall length. Both could see through armor flaps and additional round pistol ports sights on the sides. There was also a hatch in the roof of the driver’s compartment where the commander could stand. In the middle was placed the main fighting compartment with the sponson machine-guns which could fire within an arc of 110°, and most of the ammunition storage and tooling. The rear was occupied by the main gun turret with a large sloping front plate, a traverse angle of 260°, which could be accessed through a butterfly hatch in the roof. It could communicate with the machine gun compartment for resupply. The engine was a carburetor gasoline 4-cylinder air-cooled with capacity of 30 (army) or 35 liters (navy), served by a five-speed gearbox (4 forward/1 reverse). Due to the weight of the armored body, maximum speed was just 18 km/h (11 mph), and only 3 km/h (1.86 mph) in reverse, causing turmoil in operations due to the tactics used. To this end, the transmission was modified and a special reversing clutch, operated by a lever from the driver seat was installed. With this coupling all four forward gears became reverse ones, and the rear, front one. 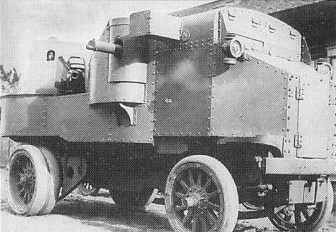 A “mirror inspection device”, located on the right side of the cab and operating like a periscope was fitted to help the driver but later proved ineffective in combat. The engine could be started both from the outside and inside by an electric starter. Fuel tank capacity was 132.4 liters. The transmission chains on the rear axle were protected by armored casings, and the axle rested on doubled artillery-type army spoked wheels. Chains could be mounted for better grip in the snow. Production began at the Putilov factory in late March 1915. 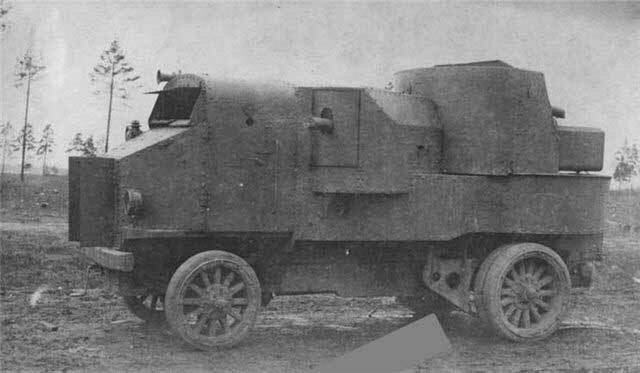 The GVTU initial order was for 30 armored trucks, and by August 1915, nineteen had already been delivered and another eleven were in various stages of completion. The last car was commissioned on September, 28. But already on September 2nd, 1915, Putilov received an order for 18 more intended for the Naval Department. These were to be used to protect the marine fortress of Reval (later Tallinn). These had a number of significant differences, mainly with the body thickness and construction, according to some sources a new extended chassis and also apparently a more powerful engine (35 hp). Ammunition was increased to 60 shells and 9000 rounds for the machine-guns. However, these extra chassis were to be purchased in the United States and only reached Petrograd in February 13, 1916, which significantly delayed their delivery. The very last of this second series was delivered in early December 1916. Combat weight was increased from 8.6 to 11 tons and their dynamic characteristics deteriorated. Later modifications comprised a rear wheelhouse intended to improve the rearward driver vision. Already in mid-1915 field makeshift conversions were made with redundant aft controls. 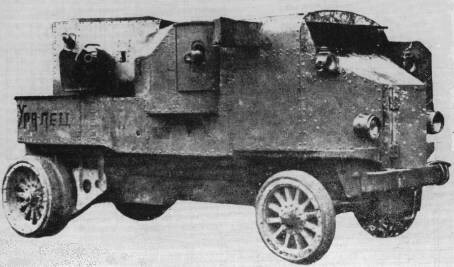 The first Putilov-built reverse set was ready by the end of January 1916, accepted after testings and conversions were gradually carried out in 1916. On April 16 the first batch of Garford-Putilovs was put at the disposal of the passive defense. After two and a half weeks to train the crews, on May 3rd, 1915, this unit was sent to the South-Western Front, at the disposal of the 5th Company of armored cars. The organizational structure of AC platoons consisted of two “Austin-Putilov” and one “Garford” (some platoons had three Austins), as well as auxiliary and technical, fuel and supply trucks, staff cars, and scouting motorcycles. In total the Army was provided thirty of these AC platoons, which were nearly all assigned a proper name (ex. the 5th Platoon was the “The Immortals” or “Fearless”, 6th Platoon the “Siberians”, “Terrible”, “Zabaikalets”, “Kolyvanets”, “Bayan” etc.). Navy platoons operated within the motorized artillery division of the sea fortress of Peter the Great, also with proper unit names. From 1915, the “Putilov-Garford” units served in almost all areas of the Russian-German front. Despite rather weak handling characteristics, especially off-road and on soft ground, these armored truck were popular because of their firepower. The Navy versions actively participated in the battles of Reval at the end of World War I. The 1st Siberian Rifle Corps units under the names of “Revelets” and “Invincible” supported until the end of 1917 the 11th and 77th infantry regiments, defending the capes of Olay, Rolbum, Borenberg and Radenprays. However, due to the collapse of the army and general retreat, both units were captured by the Germans in generally good condition and after minor repairs, put back into operations. In early October 1917 two other Marine units participated in the Moonsund battle, during which 1st Rank Captain P.Shishko distinguished himself during the defense of Orissaarskuyu dam. During the retreat two armored cars were blown up in order to avoid their capture by the enemy. Losses were surprisingly low. 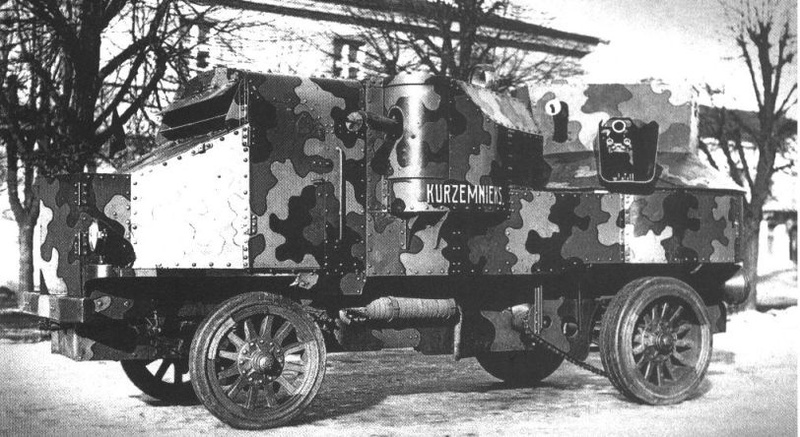 In August 1916 commander reports stated that only about 15% of their armored trucks had been lost in action. During the Civil War, captured Garford-Putilovs were largely used by the warring parties, but mostly by the Bolsheviks. One of the first use by the “Whites” was in the Yaroslavl uprising which began in July 1918. These armored trucks participated in almost all major operations of the Civil War on both sides, and many machines were renamed according to the preferences of their new owners, like “Karl Marx”, “Trotsky”, Kornilovite” and “Drozdovets”. In 1920, as part of the 42nd Consolidated heavy detachment of the Red Army, six acted on the Kakhovsky bridgehead. These “red” vehicles acted as a mobile anti-tank reserve whereas the “whites” were given British and French tanks for the task. 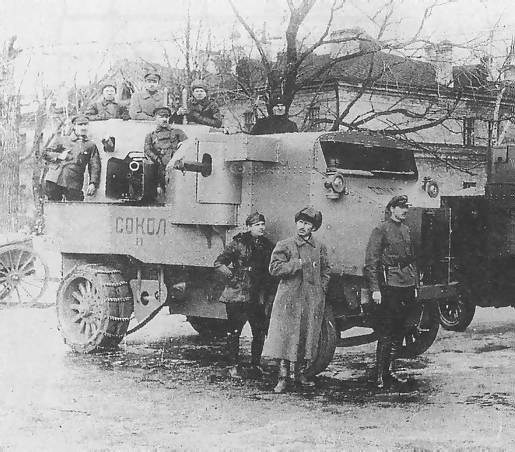 With the defeat of the White Armies more ex-Tsarist armored trucks fell into the hands of the Red Army, ultimately no less than 30 of “Army” and “Navy” types. But because of the severe lack of spare parts and maintenance, by December 1921 this fell to 26, of which only 15 were active, and 11 reported in repairs. They were badly worn, especially the undercarriage. By 1923 it was decided to completely remove the chassis of some and turn them into railcars. This task was given to the Bryansk Engineering Plant, converting 21 Garford-Putilovs. 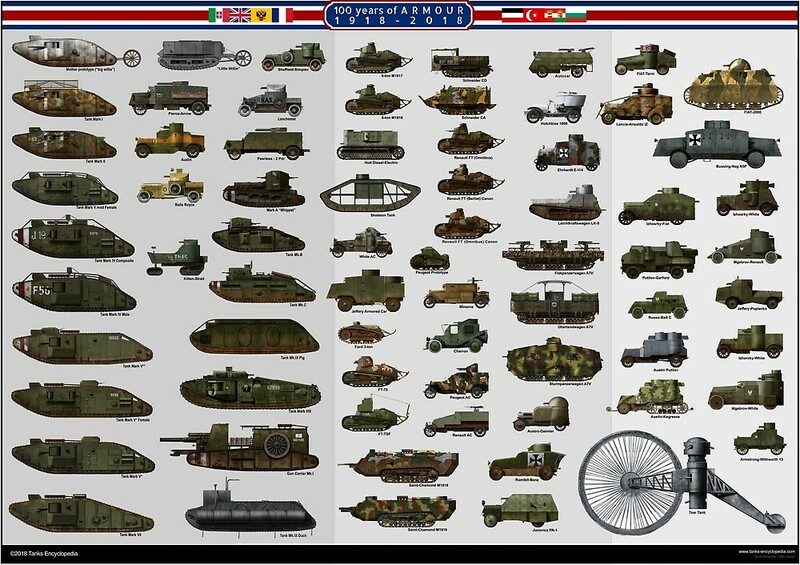 In 1931, the ABTU Commission declared all types of WWI era armored vehicles obsolete. Subsequently all surviving “Garford-Putilovs” were dismantled and the armor plates transferred for other uses in the Red Army. 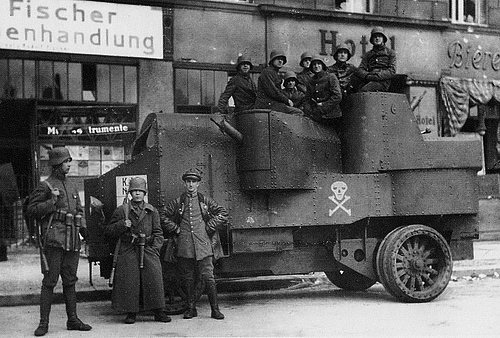 During the years 1916-1918 German troops captured at least five “Garford-Putilov” armored cars. At least three were rearmed with German machine guns (probably MG.08) and were included in the German armored division «Kokampf» (Freikorps). During the revolutionary events in Germany (1918-1921), these were used in the suppression of communist uprisings in major German cities, like Berlin. Poland also got three former Russian “Garford-Putilov”. The first was captured in February 1919 in the region of Vladimir-Volyn-Kovel. The second was captured at about the same time and also joined the «Zagłoba» platoon. A third vehicle called “Uralets” fought on the Bobruisk-Mogilev road. Later, another renamed «Generał Szeptycki», was included in the “Wielkopolski Pluton Samochodów Pancernych” or Wielkopolska platoon of armored cars. It was sent to Warsaw, at the disposal of third armored car division, and in 1921 came to Grodno. According to the inventory in 1925, all three were transferred to Krakow, where they joined the 5th Armored Car Division. In 1927 they were gradually decommissioned. Latvia also got its share of these vehicles, like the «Kurzemnieks», camouflaged in the 1920s, acquired during the fighting in November-December 1918. 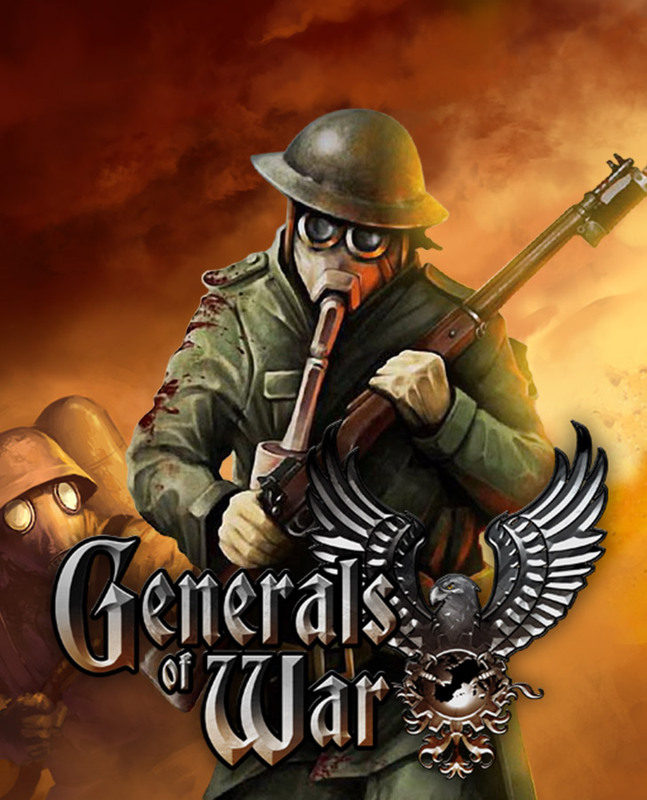 But later alliances shifted and German troops encountered fire from a Latvian “Garford” under the name of «Lacplesis», which covered the retreat of the infantry. One was captured and immediately incorporated into the German Freikorps and used against their former owners on the approaches to Riga. It was used later in Berlin against the “Spartacus” rebels and scrapped afterwards. 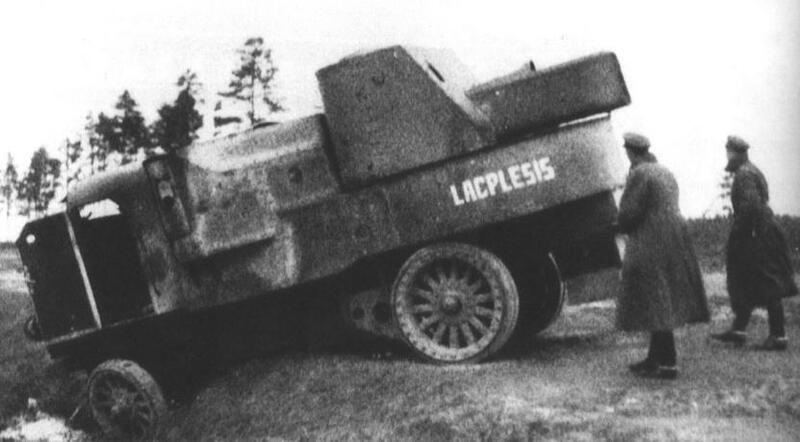 According to other reports backed by photographs all volunteer army armored Freikorps trucks, including former «Lacplesis», were turned to the Latvian, and one continued to wear the German notation and was renamed «Kurzemnieks». Imperial Russian “Sokol II” in 1915. Latvian “Kurzemiesk” with a three-tone camouflage, circa 1920. German Freikorps’s Garford-Putilov, with the distinctive skull and crossbones. A Putilov-Garford during the winter of 1915-16. The original U.S. Garford 4×2 5-ton Lorry. Probably one of the very few Putilov-Garford ever camouflaged, the Latvian “Kurtzmnieks” in 1920.